Trip Runs Monday, April 1, through Thursday, April 4, 2019. RAPAPORT... 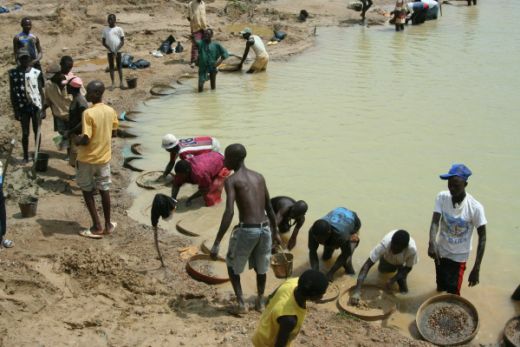 The Rapaport Group is organizing a trip to Sierra Leone for members of the diamond and jewelry trade wishing to gain insight into the artisanal mining sector. The visit will provide an opportunity to meet and interact with the artisanal digger community in the country. The mission will promote greater understanding of the role of the artisanal sector in the jewelry industry. It will highlight and demonstrate opportunities for profitable sustainable economic development available to the jewelry industry. It will encourage understanding and relationship building between artisanal diggers and the jewelry trade. Jewelers, dealers, and diamond manufacturers are invited to register their application for the trip via https://bit.ly/2Hq2iHU. The mission will be limited to 25 participants due to strict logistical limitations. For additional information, please email: SLTrip@Rapaport.com. Please note. This is not a diamond buying trip. While business connections will be available and encouraged our mission is to develop relationships and opportunities for future business and development activity. Participants seeking to buy diamonds in Sierra Leone may be accommodated after the conclusion of the mission on Friday April 5. Advanced notice of intention to buy is required so that we can ensure compliance with all government regulations. Rapaport will be providing all ground arrangements. Including hotels, food, transportation, and security. Freetown accommodations will be in a 4 star hotel. Kono accommodations will be in a 3 star hotel. The fee for the trip is $2,000 per participant. It includes all ground arrangements but not air travel. All participants will require a Visa, Yellow Fever vaccination and malaria medication. The Rapaport Team can assist with obtaining visas and meeting other requirements. Official program ends after breakfast Friday. Participants may wish to extend their stay at their expense. Martin Rapaport will be remaining in Freetown through Sunday. Air travel to Sierra Leone is limited. Upon acceptance, participants are advised to contact their travel agent as soon as possible to ensure that they can reach Sierra Leone by Monday April 1. Martin Rapaport will be traveling from NY on March 31. Rapaport travel agents can assist with reservations. Participants should complete the online registration application as soon as possible. Rapaport will notify applicants that have been selected for the trip on an ongoing basis. If there are a large number of applicants efforts will be made to accommodate a second trip. Click here to register. 22:00 Welcome Dinner; Overnight in Freetown. 06:30 Depart to Kono; Visit artisanal digger sites and Koidu city. 17:00 Meet with Diggers and their Associations. 19:30 Dinner with Diggers; Overnight in Kono. 08:00 Depart for Visit to Koryardu Village, meet with community. Optional hike to location where Peace Diamond was discovered. Note: This hike can be strenuous and is about 1 hour each way. Opportunity for participants to experience what diggers do everyday. 12:00 Visit Nimiyama Chiefdom and Village. 20:30 Dinner in Freetown; Overnight in Freetown. 09:00 Development Diamond Conference with Members of the Artisanal Community. Discussion about the role of the diamond and jewelry in Sierra Leone. Meetings with government officials. 12:30 Lunch with members of the artisanal community. 14:00 Tour of Freetown; Shopping.